A multi-functional open-plan living space requires a different approach to interior design. More often than not, you are faced with a blank canvas and almost anything goes. Your first consideration should be to consider how to use the space. Are there just four blank walls or is the space already divided? If so, do these divisions fit your needs? Erase any preconceived thoughts and don’t feel constrained by traditional room divisions. Walk around, viewing the space from all angles. What do you see as you go through the ‘front door’? It has the same effect as walking into the hall in a house, except the other ‘rooms’ are all here too! In principle, the first areas you come to should be used for living and eating. Site your sleeping and bathing areas as far from the main door as possible to give some privacy and feeling of sleeping within your home as oppose to camping in the hallway. One of the many plus points of loft living is the vast expanse of natural light. Think about whether your loft gets morning or evening light. Although natural light in large areas is a bonus during the day, large bare windows can create a very cold atmosphere at night. Allow for this when planning your furnishings. Artificial light must provide two functions. Firstly, it must give good overhead lighting over a large area, and secondly, lower table lighting is necessary for a more intimate feel in the areas dedicated to relaxing and entertaining. In other words every lighting eventuality must be provided for! The more flexible you make your lighting, the more you will be able to create the illusion of separate living areas. Loft floors have to be practical. Unless there is a natural division of space, it is better to use the same surface throughout. Wood is a popular choice, with rugs giving different moods and identifying separate areas. With high-tech living, textured rubber floors can look wonderful. One disadvantage is they mark very easily, but if your loft is not subjected to a lot of use, this is easily compensated for by the fabulous range of colours and textures available. Keep loft colours simple. Select a basic colour and concentrate on using tone upon tone and reflected in different surfaces and textures punctuated with dramatic accents. This is the one environment, with so much space available, where you can use really strong accent colours. If you have a very large space, you could try painting a corner in dark dramatic colours, but do make sure this balances with the colours used elsewhere. Choose a theme that you can use in all different areas. 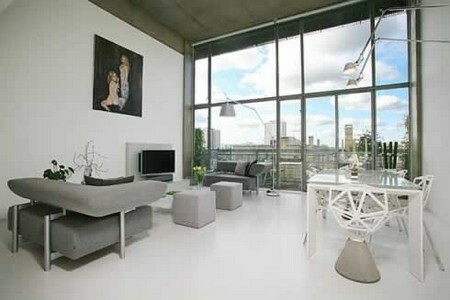 Japanese minimal style suits loft living and is a good example of using a basic colour with strong accents. Natural themes are a good choice, as the walls are often bare brick, and the neutral colours provide a good backdrop for a variety of accessories. Balance your ideas, as each area is going to have its own focal point. 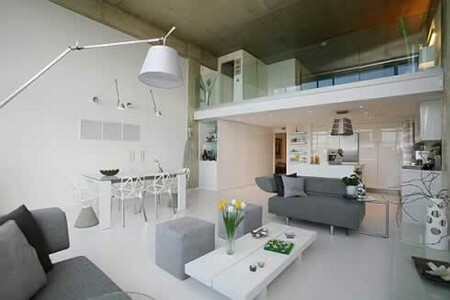 Organization is the word to remember when furnishing your loft apartment. You must work out what you have to fit in and where you are going to put it. Do you have space for floor to ceiling cupboards that will hide a multitude of sins? Think about how you are going to create individual room areas. Screens, blinds, even bookcases can all provide room dividers. If you live in a smaller studio, have you a space to store a folding table and chairs only required for when you are entertaining? Most importantly, don’t compromise on comfort, as you are working, resting and playing in the same space. Focus on blinds, shutters or nothing at all if you are high up above the roof-line. Lofts love large oversize accessories. A single lily in a large vase for instance is far more effective than a small arrangement of assorted flowers. A pair of large Chinese pots that would look too large on the floor in a standard house look fabulous on a table, dividing a living and eating area. Be selective with pictures. A large abstract oil painting can look very dramatic, but a simple option is to think of collecting contemporary photographs. High-rise lofts lack a garden or even a view of one. Large ferns and even a simple window box of herbs in the kitchen area can all help to bring the ‘garden indoors’.